I explore the spaces we exist in, both physical and psychological. I use the landscape which surrounds me as a metaphor for my inner life of imagination and emotion. The material and immaterial are not separate but are reliant on each other to create meaning in our lived reality. Drawing dominates my practice at present as the media most compliments and mirrors my subject matter, which is expressing facets of our existence. In drawing there is a relation with the provisional and unfinished, it exists in a state of suspense so connecting it with the lived life experience. Drawing records the unfolding of an event, not the fixed reality of an object. It is a dialogue between our thoughts and our experience of the real; drawing has always been aligned with thinking and ideas, it has as much to do with reflection as with observation. I draw what I know and experience not just what I see. These are not drawings from life, but drawings of life; drawing the relation between the visible and the invisible. The fragmentary nature of the images reflects that although we live a linear existence, what we currently experience is altered by memories and expectations, our present being created by these absent moments. The sharp contrasts also convey emotion and induce contemplation in the viewer; they suggest a theme of constant change as the eye moves through the transitioning spaces of constructed and negative spaces. Originally I trained as an illustrator and worked in publishing, however in 2009 after having spent some time raising more children than is really sensible I decided to escape from the Playground Mafia and I returned to Art college to study Fine Art. I graduated with a First Class degree in 2011 from Norwich University of the Arts. Since then I have exhibited widely in my home county of Norfolk as well as London and across the UK. I have been a finalist in the International Saatchi Drawing Showdown, featured in series 2 of the BBC 2 Programme 'Show Me the Monet' and was Visual Art Trader’s Artist of the Month, they wrote of my work: "The senses of emotional uncertainty, of time evaporating and of forgotten memories in Kirsty's drawings are made all the more powerful by the beautiful and precise execution of the images." I have work in private collections in London, New York, the UK and the Middle East. 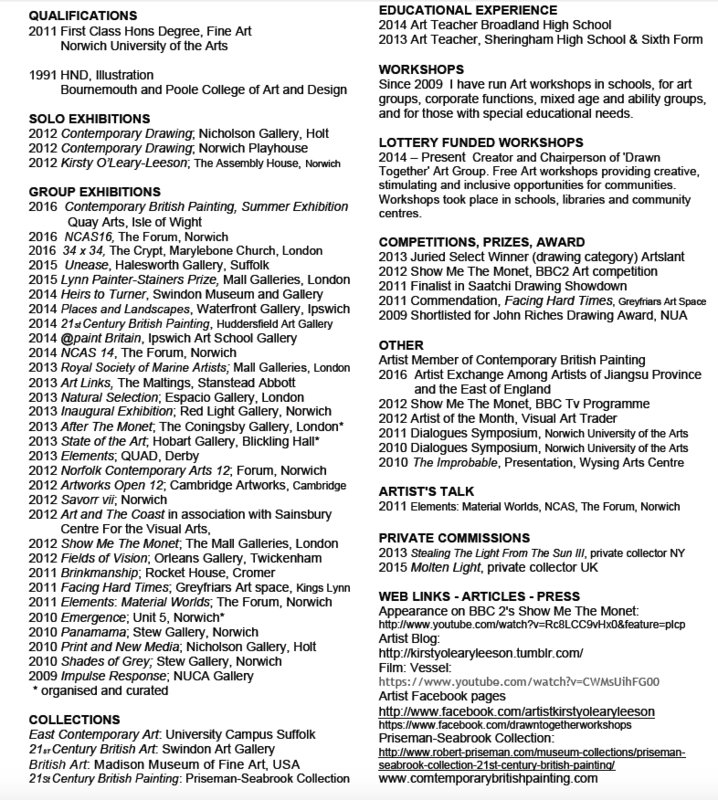 My work has been acquired for public collections including the Madison Museum of Fine Art, USA, Swindon Museum and Art Gallery, Priseman Seabrooke Collection (for further details see below) and the ECA collection University Campus Suffolk. In choice of medium, Kirsty O’Leary- Leeson changed the history of drawing. Her masterful pencil drawings scratched into gesso record the unfolding of an event with visible and invisible elements in nature such as extreme light and variation of focus. The purity of her work derives from her virtuoso draftsmanship and media. Contrary to master draftsmanship practice since antiquity, the artist rejects paper because, in the artist’s words, “… the textured surface becomes part of the drawing.” To focus the viewer solely on the image, Kirsty sprays a wooden board with gesso and polishes the surface until smooth. Using a hard #14 pencil, she builds her images with tiny marks embedded in the gesso. People often look at my work not sure what media it is, is it some kind of photo or a print? They comment that they have never seen anything like it before. My artworks are all hand drawn with a pencil, however I do not work on paper; this is because the textured surface of paper always becomes an integral part of a drawing, however my work is purely about the image, I do not want the substrate to interfere with it, it exists free from it's substrate. I have wooden boards sprayed with gesso and lightly sanded down to give a very smooth surface onto which I draw directly. I use a very hard 4h pencil, because the surface is hard anything softer creates too much loose graphite. The images are built up with very small marks, I do not 'shade' but embed each stroke within the gesso. Gesso is an unforgiving medium to work on, unless the mark is very light you cannot rub it out, so I have to work carefully and meticulously. The collections are formed into three categories – 21st Century British Painting,​ ​20th and 21st Century British Works on Paper and Contemporary Chinese Works on Paper. The focus of each collection is on painting and drawing made by hand. Each collection seeks to explore, promote and question the relevance of painting and the hand-made work of art in the digital age through loans, exhibitions, talks and publications. They have grown through direct working and personal relationships with many of the artists represented and been enabled by painting swaps, donations and occasional purchases. We especially welcome loan requests from schools, not-for-profit galleries and council run art museums.